I remember some years ago when I used to read about ecology, behavior and evolution, how fascinated I was by the classic book of G. Evelyn Hutchinson, The ecological theater and the evolutionary play (1965) and by the way that book was depicting niches in ecology and evolution. Separation of niches and consequent speciation occurs constantly and could look simple in the first look. On the other hand, the resulting diversity could be also beyond imagination. Different depths in the cork of an old tree in a tropic jungle can provide different micro-environments to the species living in them, both micro and macroscopic. Various tiny species of insects and other invertebrates could live in different depths of the cork of the tree; different species of birds could feed from them using specialized beaks that penetrate different depths of the cork, so that they would not enter the other species’ niche. It does not just end there. Species distribution varies by height of the tree as so do the mico-environments. And yet even more, in some cases speciation can be temporal with different species of birds coming to the tree at different times during the day. Thus, a tree could act as countless niches for countless species and thus countless biologic diversity. Years later, I stumbled upon the same phenomenon in the world of parasites. As I was looking through the second chapter of “Foundations of Parasitology” by Schmidt and Roberts (2005), I realized that the vertebrate intestinal tract could be looked at the same way as a tree. Along the intestinal tract, different environments exist, in terms of physical conditions, nutrients, pH and enzymes. Therefore, we should not be surprised to see the same trend and observe different parasites adapting to different micro-environments along the tract and staying away from each other. 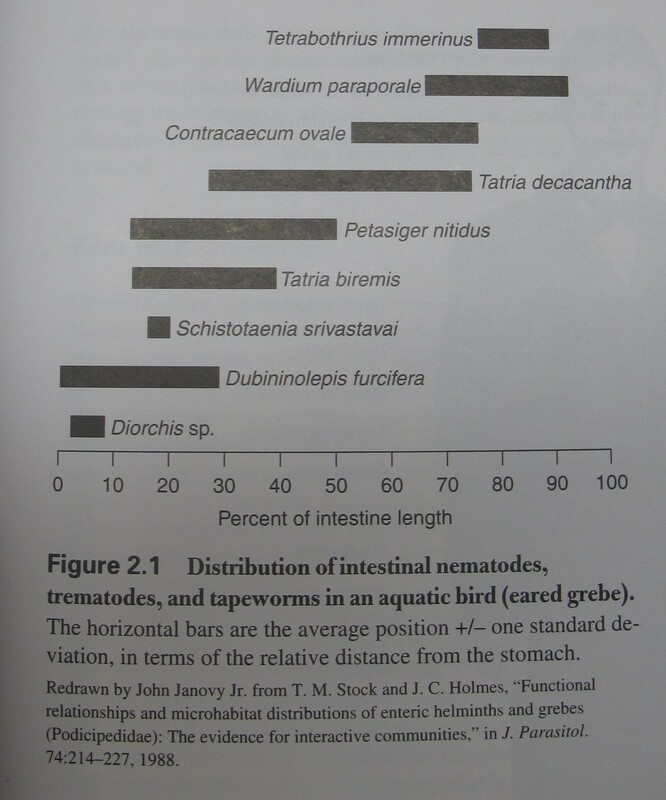 Below is a graph of distribution of different intestinal worms along the intestine tract of a bird. The bar shows distance from the stomach. 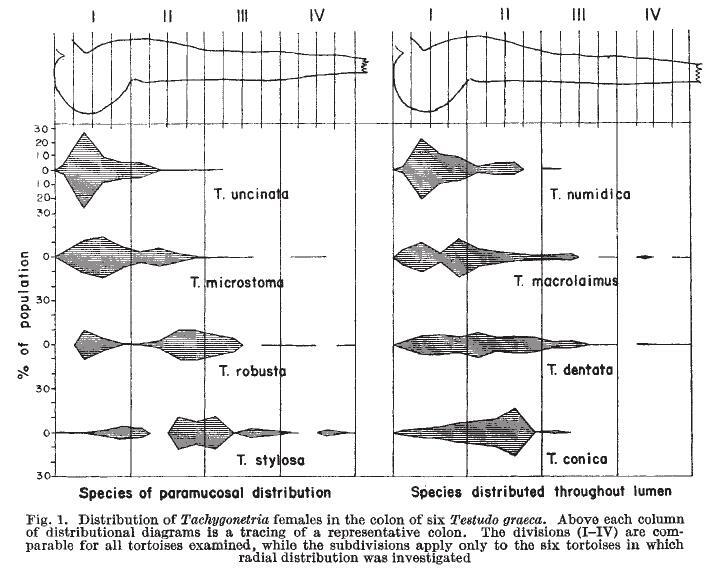 Specialization and separation of niches among different parasites can be readily seen (Stock and Holmes 1988). Another study that the book chapter mentions is about 8 different species of nematodes that were found to be distributed in the intestine of a turtle, not only longitudinally but also radially with preferences towards either lumen or the ring of the intestine (Schad, 1965). Sometimes we go in so deep into our molecules that we miss the big picture of biology of parasites. How they interact with each other and with their hosts in an ecological and evolutionary point of view. I guess the beauty of biology is that no matter how diverse and complicated the organisms and their relationships can get, still the same principles and patterns apply.